The era of the girls' band carries on, as Kasumi and Poppin' Party's previous success leads them to a new ambition: their own self-sponsored show! This proves more of a challenge than they expect, but thankfully their friends in all the other girls' bands have advice and assistance to offer them. But Poppin' Party isn't the only band with aspirations, as an enigmatic producer named CHU2 is putting together a new band to take on the musical world, and she's set her sights on Tae to make it happen. With the opportunity to reconnect with her childhood friend Rei and play in a group that's truly at the level of her musical skill, will Tae be swayed to leave Poppin' Party, or will the group's bonds hold them together for their ambitious upcoming performance? 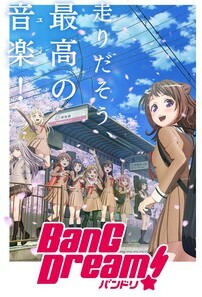 The second season of BanG Dream! may have ‘Season 2’ right there in the title, and it does technically follow up on the events of the initial season, but its status as a sequel to that show is nominal at best. Instead, this new season could be considered a ‘soft reboot’, retooling just about everything about the series from its tone, focus, and even animation style into something more reflective of the franchise 's successful mobile game. With the pressure of being a franchise -launcher off its shoulders, this is technically the stronger show of the two, though how much enjoyment you get out of it heavily depends on your prior investment in all things BanG Dream! . Right away, one thing BanG Dream! Season 2 has going for it over the original is how it handles tone. This one allows its story greater degrees of emotion, with the inconsequential hang-out times embracing that breezy, slice-of-life atmosphere that the original couldn't fully manage. Not every event in these bands' ongoing careers is treated like a do-or-die struggle, and that means when the major bombshells do drop, the contrasts in tone affords them more impact. This becomes especially apparent as the two major plotlines of the season crystallize: Poppin' Party planning their self-sponsored show, and Tae potentially leaving the band to join new group RAISE A SUILEN . The concert-planning story fills out the background of the majority of the season, ensuring that some level of plot is happening regardless of how frivolous any given episode might be. It provides an arc to the story without overloading on drama at every possible turn. For the first half of the season, it's mostly an excuse for Poppin' Party to interact with the other bands on an episode-by-episode basis, while the second half lends more immediate deadlines to the issues that arise from Tae potentially leaving. It can also be seen as a solid excuse to have a big string of musical performances to play for its finale. Bringing in all the other bands for focus episodes in the first half of the season encompasses both what's freshly appealing and also most frustrating about this season. The anime has opted to ride its core mobile game's popularity by actively incorporating all the other bands who play parts in that game. In practice, this means that aside from the main characters' Poppin' Party and the previously-introduced Roselia , a full fifteen additional characters are all dropped into the anime's cast. The issue is that none of these ‘new’ characters are properly introduced, and even the former main characters act as if they've known them the whole time. This is true as far as the franchise goes, but any anime-only viewers may quickly find their heads spinning from all the new faces. The focus episodes we get for each of these bands serve less to properly flesh them out and more to parade them around for existing fans. They're uneven in that respect as well—the episode focusing on Hello Happy World, for instance, is a delight that's almost worth watching on its own, contrasted with Afterglow 's utterly forgettable outing. Not content to cram in all the game's characters, this season also sees fit to introduce brand-new ones. They exist at the behest of the plotlines they support, with Poppin' Party fangirl Rokka supporting them throughout their show-planning, while the other four new girls form the band that tempts Tae away from the group. Only a few of them make a memorable impact at this point in the story, with producer CHU2 being notable as a rare true antagonist in a series like this, who peppers her speech with bizarrely-accented English in one of the strangest seiyuu performances I've heard in a while. Meanwhile, Rei adds in a new backstory for Tae that informs her plotline, which proves to be the truest strength of this season. Like Saaya's plotline in the first season, Tae's is the most fully-realized in terms of drama, and it works even better since all those ‘serious’ elements are confidently concentrated in her arc. Tae had previously been one of the more lightly-characterized members of the main cast, simply coming across as the ‘weird’ one. Her new storyline rounds back to the bond she established with Kasumi, demonstrating that building a meaningful relationship through playing music is something she's done before with Rei, and now the need to fulfill that loyalty can divide her priorities. The conflict between bands is a fairly standard kind of plotline for a series like this, but it builds to some rather surprising heights in its best moments, particularly a shocking gut-punch in the ninth episode. But like the aforementioned Saaya plotline, Tae's plot only takes up some of the season's runtime, with the rest of the show simply coasting on band-service. Along with appearances by all the bands themselves, this also manifests in regular musical performances from all of them, a welcome change after the previous season's surprising lack of music. Every episode has at least one song, with the first and last episodes in particular being loaded up with half a dozen songs each. This is largely just a distraction in the first episode, but it works better in the finale, capping off a two-episode victory lap for the story with a whole set of new songs from each band. In keeping with the show's ambitions, it seems designed as a crowd-pleaser for existing BanG Dreamers. On that note, the greatest difference between these two seasons is definitely the animation. The look of the first season was one of the few solid things about it, but a studio change has made Season 2 an entirely 3DCG production, presumably to conserve resources for all the musical performances. As such, BanG Dream! definitely looks more stiff and bland in its second season. There is some care paid to giving the characters distinct facial animations, and several fun sequences and cute touches pop up throughout. By the last few episodes, the CGI is polished enough to have several characters on screen all moving and doing things at once. But aside from a few clever camera tricks in that finale, the animation never really exploits the advantages of its medium for interesting concert choreography or otherwise. It feels like a concession at best, the one change in the show that's definitely a distracting downgrade. One last note needs to be made for Sentai Filmworks ' subtitles provided for this series. There's remarkable inconsistency there, with many names and catchphrases inconsistently localized until several episodes into the season. The biggest issue is the lack of subtitles for song lyrics. The sheer amount of singing in this season makes the missing translation for them stand out, and it reaches an egregious climax with ‘Returns’, the new song by Poppin' Party performed in the last few episodes. The lyrics to this song reflect a lot of the characterization and plot details that lead up to it. It also features a key moment at the end of the second-to-last episode that the lack of subtitling would botch if not for a translation of the written lyrics in a notebook appearing at the last second. It's a baffling omission for a franchise so built on the presentation of its music. As a product for mobile game fans, BanG Dream! Season 2 gets the job done just fine. It balances the story's light and dramatic elements more effectively than the first season, there's more music, and more of your favorite characters get on stage to play it. But it still leaves the whole exercise feeling scattershot as a complete season, clearly existing as a promotional tie-in before anything else. The sheer amount of pandering also locks out any newcomers who might consider this as a jumping-on point, and I certainly can't recommend anyone sit through the first season just to check this one out. The second season of BanG Dream! rises up to the level of ‘okay’, but there are still a lot of caveats to iron out before it can be called a true success for all but the most devoted.